Obtaining and preparing for a job interview is hard work. But even if you've done your homework and give the best answers to tough questions, there's still something that might keep you from getting that job: your interview body language! We all subconsciously judge each other to some extent based on eye contact, facial expressions and other forms of body language. In this helpful article, guest author David Bain offers some great advice on using your body language to help, not hinder, during your next job interview! The following article summarizes the top 10 ways to ensure that you show good interview body language. Make sure that all the preparation you do for a job interview isn't in vain. Your body language is key to job interview success. There's nothing more off-putting to an interviewer than the interviewee being unable to make regular, good, strong eye contact. The interviewer may think that, because you're unable to do this, you either have something to hide, or you may not have the conviction of your beliefs. If you have difficulty concentrating when looking straight into someone's eyes, then try looking between their eyes. They won't be able to tell you aren't looking straight into their eyes, but you'll find it easier to maintain focus. Try it with a friend first to see what I mean. You need to practice a strong, sincere smile. A good smile has the power to say, "I'm a happy, confident person and I'd love to work here." Try practicing smiling in a mirror. Practice a smile that puts people at ease. It's just as much your responsibility as theirs to ensure a relaxed atmosphere during the interview. If you're embarrassed about your smile, see what a dentist can do about it. It might not cost too much to fix your teeth - and it will get you a lot of money if you get the job! Again, try practicing with a friend first. Make sure your legs are slightly apart if you're a gent. Place your hands apart, on your thighs is good. Open body language is even more important when the interviewer is talking. It demonstrates that you are receptive to the question and actively listening. Remember when you practice your body language with a friend to take note of what to do with each part of your body. Unless you do that - and remember - you're leaving it to chance that your body language will come across well at your job interview. It's easy to appear as if you slouch too much. This is especially prevalent if you're asked to sit in a large, soft seat. Try not to appear too relaxed. Not sitting all the way back in the seat is a good idea. If you sit forward, it makes you look more attentive and more interested. Some people slouch because they're not very interested. Other people slouch because they have bad body language. Either way, an interviewer isn't going to be too impressed. Try practicing in a mirror at home. If you're too erect then you won't appear relaxed. If an experienced interviewer is interviewing you, they might put this down to stage fright. They might judge you on what you're saying rather than how uptight you appear. However, if your interviewer isn't too experienced, they might not feel relaxed either because of your posture. They could leave the interview with a feeling that you weren't as good as the other person simply because you were too erect. Try to relax...but not too much! It's all very well having good eye contact at your interview, but if your eyes aren't looking bright and interested then you're making life difficult for yourself! Make sure you have a good night's sleep before your interview. Remember - this is a very important day - you need to look your best and have no bags under your eyes! If you want your eyes to sparkle, then it's worthwhile getting some whitening eye drops. It doesn't cost much, but it will work. It's important to be subtly positive at your job interview. You need to demonstrate that you're actively taking part in the interview. When your interviewer is telling you about the job role and company, make sure you nod subtly. This shows that you are listening and are interested in what they are saying. It shows that you are engaged in the discussion process and want to be part of the organization. One of the best ways to relax before an important interview is to breathe deeply. If you breathe deeply, not only are you relaxing by slowing your rapid, nervous heartbeat, you're also ensuring that your brain has as much oxygen as possible. This means you'll be able to think clearly at your interview and be able to respond to difficult questions more rapidly. Breathing deeply before an interview will provide you with the effective combination of being relaxed and alert at the same time. You may not feel like having a glass of water, but taking a sip of water can have a calming effect on your interview performance. It can give you an opportunity to collect your thoughts while refreshing yourself. It will also give you a chance to get used to the surroundings while the interviewer is out of the room getting the glass of water. This will also give you the opportunity to gather your thoughts and decide upon any amendments to your interview strategy, as well as review your prepared responses to questions. So many people don't have the right "professional" handshake. Remember, this is part of the first and last impression you make at the interview. If you have a weak, limp handshake, this tells the interviewer that you may not have the ability to deal with confrontation. On the other hand, if your handshake is too strong, then you may not be a good listener. You may be quite confident about controlling a situation, but you may be less likely to be democratic in approach. To demonstrate the happy medium, have a firm but not hard grip, make good eye contact at the same time, and mirror the style of the person whose hand you are shaking. In summary, mirroring is the key. If you're able to subtly copy the tonality of your interviewer's body language, you'll find it much easier to communicate because you'll be speaking the same silent body language. 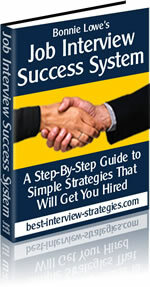 This will put you streets ahead of the competition in the race for your dream job! David Bain is a consultant to Uteach Recruitment who specialize in UK Teaching Jobs.